Leaving North Carolina to help a friend in New York, Antonio Dixon never imagined he would find himself homeless in East Stroudsburg, PA. In the summer of 2018, Antonio was brought into The Salvation Army Emergency Shelter program. Today, Antonio leaves our shelter program for all the comforts of home. “Now he’s leaving us, and I couldn’t be prouder,” she continues. “Although, truth be told, I am really going to miss seeing him every morning,” Cymanda says, her voice cracking. Obtaining employment is part of each shelter resident’s case management plan. And guess what? 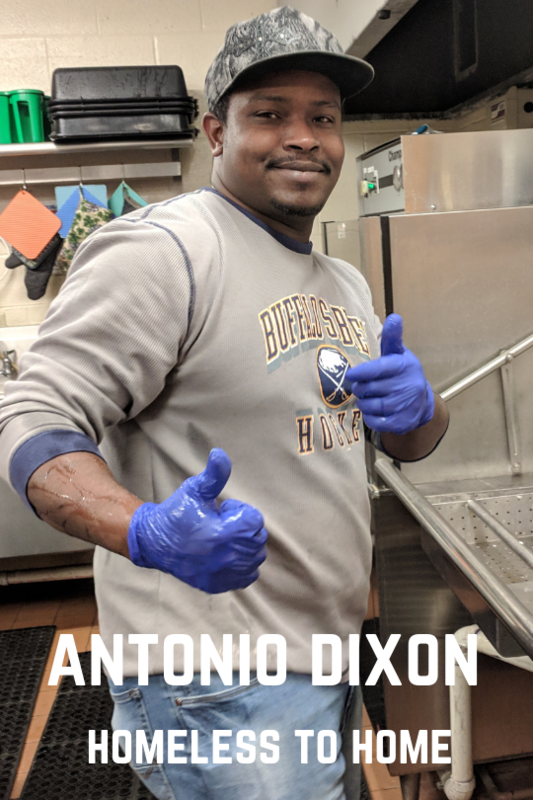 Mr. Antonio Dixon found employment right here at The East Stroudsburg Salvation Army. That’s right. You can find Antonio preparing delicious lunches as our Soup Kitchen Assistant. Even though we bid Antonio farewell and wish him all the very best in his new home, we are thrilled to be able to work with him every day.